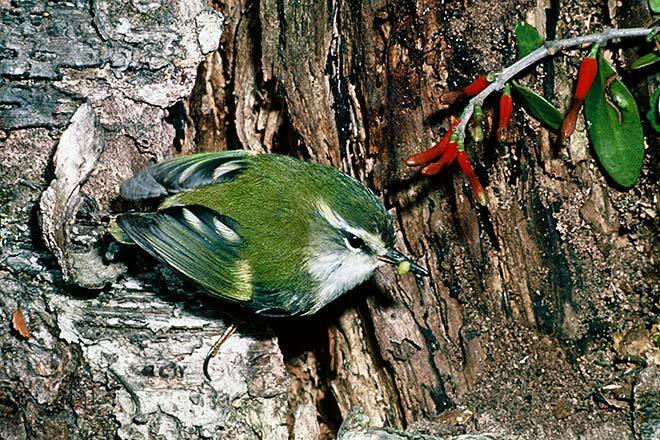 The 7-gram rifleman or tītiti pounamu is New Zealand’s smallest bird. It belongs to an endemic family, Acanthisittidae (New Zealand wrens), probably isolated in New Zealand since the separation from Gondwana. The rifleman can fly short distances, generally within the forest – not across open spaces. It feeds by hopping up tree trunks, gleaning insects and spiders from cracks in the bark. The rifleman’s call is a repeated high-pitched note, out of the range of many people’s hearing.